I have featured several sets of events on this blog where we used dozens and dozens of roses. This “ruby-themed” dinner for Mrs. MM’s birthday, for example. Or roses arranged a la Jeff Leatham, here and here. There have also been posts where roses were cut short, for a christmas topiary, for gift arrangements here and here, and other events. So it surprises me that I have never featured the key tools of the trade… In answer to reader “acmr’s” questions, in the previous post on roses, here is a glimpse of my toolbox. Yes, it is a literal toolbox. 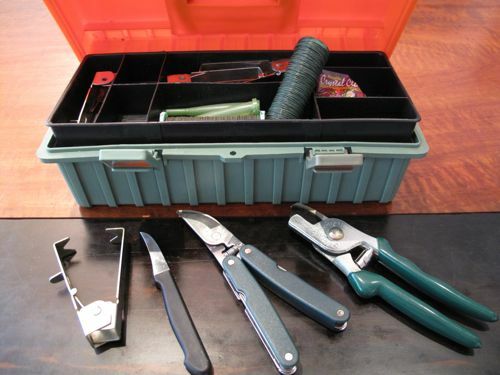 In it I have shears, wire, plant or flower food, sharp knives, etc. 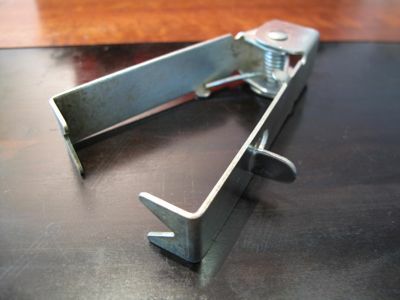 But the most relevant tool (in answer to acmr’s query) is this “thorn stripper” that works superbly with roses. You basically squeeze them gently around the stem and pull firmly downwards and all the leaves and thorns come off in a second or less. This tool allows you to strip hundreds of roses in no time at all. You can buy them at wholesale flower markets in the U.S., or probably even on-line these days. Sister sends me a steady supply, usually a half dozen of them at a time, so now we have them at the beach, in our office in Cebu and several in the toolbox. They are wonderful, and totally worth the money (Less than $8 each, I think). 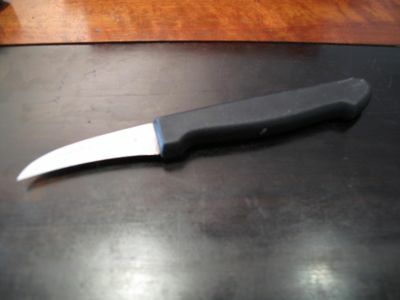 Besides the thorn stripper, I find these small, thin and sharp knives to be equally useful. They make cutting rose and other flower stems so easy and you get a clean quick cut that presumably damages the “veins” of the stem less than if you use say a scissors. Actually, NEVER use scissors to cut rose stems or many other flower stems… you are likely to crush and collapse the veins of the bloom and they will have difficulty drinking. Also in the toolbox is some green wire, some clear and green tape, etc. 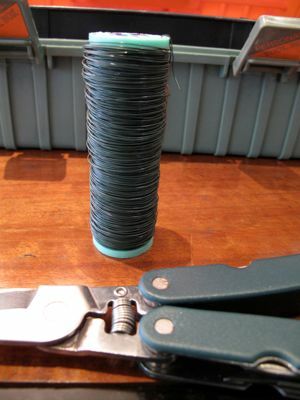 The wire is used to tie up bunches or train flowers. I don’t use it often. Tape is used to create ways to hold up stems nicely in wide crystal or glass vases. My heavy garden shears are for branches or other seriously hard-stemmed blooms or shrubbery. 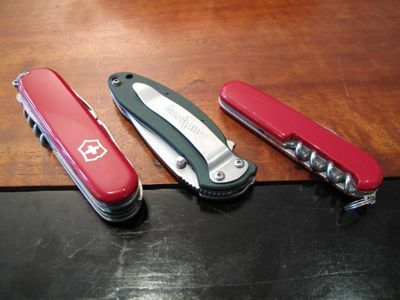 Of course you could also just use a trusty swiss knife or other pocket gadget, but with sap and all, I am not sure you want to mess with your pricey gadget. I super love this post!!!!!!! I badly need those thorn strippers to shorten the time we prep the roses for arrangement at home. Love this post! I’ve asked around shops in dangwa but they don’t seem to have those thorn strippers. Anyone know where I can get them here in Manila? Yup, hurray for Manny! 12 rounds. Judges all for Manny. $15 M in the bag. Saw his Bio episode and made me Proud to be Filipino seeing his life story. And yes, mabuhay si Manny! I just hope he invests his money well. Thanks for this! The thorn strippers are interesting! I have a ff up question, though – do you add anything in the water for the flowers? Do you need to change water daily? Mrs. Kookie, additional tips to make sure roses last as long as possible are contained in a comment I placed on this post. Please read that for more information, and answers to your questions. Thanks. Mabuhay si Manny Pacquiao!!! Kawawa naman si Margarito. Ang mukha niya maga rito, maga roon. Talagang magang-maga! congratulations Manny Pacquiao. I am not really into watching the matches of Pacquiao but I can say that it is one his fights that’s easy. I love this post!! not only about the shears and tools,but also congratulatory wishes for the Pacman!! 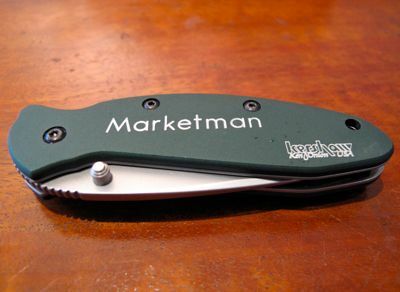 smart-looking personalized knife there, MM! never cut roses with scissors? that’s new to me! thanks, MM. millet, scissors with two blades, squeeze the stem and often bruise/crush/destroy the vessels that are the pathway for water or moisture to the bloom. Best to slice at an angle with a very sharp knife in a swift motion. wow your tools looks like well taken care of.. parang bagong-bago. Actually I have read that garden toos (especially shears) needed to be not only clean but di-sensitized. Kasi we can be cutting some stems that are with platn diseases.. and we don’t want to transfer it to other plants. Since I have become a cook this summer, I have not been doing flower arrangements for a long time… but home is soon so I will be visiting markets again and arranging and filling up my flat with flowers. Have a lovely day MM, looks like winter has arrived here.